Born 1939 in Helsinki, Finland. Lives and works in Väätäiskylä. Raimo Reinikainen trained in fine art at the Helsinki Fine Arts Academy between 1961 and 1966. From the outset, Reinikainen’s fascination with the metaphysical beauty of both nature and of his urban surroundings informed his relationship with art. Considered one of the young avant-garde rebels in the early 1960s, he developed his practice in opposition to the stale academicism that pervaded the institutions, which were champions of non-figurative abstraction. Seeking to approach universal themes, such as everyday life, death, violence and love, Reinikainen became fascinated with the anti-elitism and accessibility of pop art, in particular the work of Robert Rauschenberg. 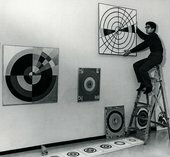 Among the paintings exhibited at his first solo show at the E-Kerho Gallery in 1966 were a series of ‘Bright Targets’, reminiscent of Jasper Johns, and canvases that incorporated cut-outs from popular magazines and newspapers in the mode of assemblage. Raimo Reinikainen’s series Sketch for the U.S. Flag 1, 2, 3, 4 1966 is a deeply anti-war pop art work emblematic of his political orientation in the mid-1960s. During the Cold War, Finland was one of the few capitalist economies bordering the Soviet Union, whose political influence was widely felt, especially among the younger generations in Helsinki. Reinikainen became highly sensitive to the effects of commercial culture, often imported from the USA, which inspired his early artworks. In Sketch for the U.S. Flag 1, 2, 3, 4 Reinikainen replaced the stars and stripes of the American ensign with rainbows and crude press photographs of the Vietnam War. As the series progresses, the stripes become wider, the collaged images gradually move towards the centre of the canvas, and the specific reference to the US flag is attenuated. The juxtaposition of the background, a possible reference to hippy culture, and the military images, perhaps suggests the universal concerns raised by the ignominies of war.